The switched controller that I used is nice, but a PWM (pulse width modulation) circuit is better. It provides cool-running operation and linear operation. It can be implemented with a small number of components. I did not build this, but am including the concept for my next levitator. At power-up, C1 is discharged and starts to charge via R6. The + input to Cp1 is held at approximately 1/3 Vcc by R1 and R2. 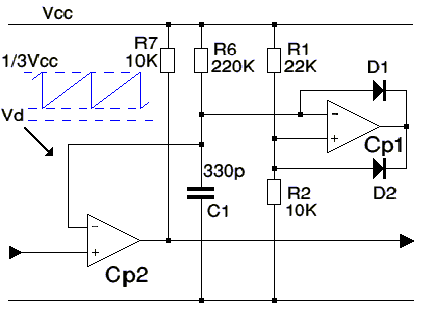 C1 charges up to this level and the comparator switches on, pulling its output low. C1 now discharges through D1 and D2 holds the junction of R1 and R2 at one Vd above zero volts. When C1 is sufficiently discharged the current through D1 is limited by R6 whilst the current through D2 is limited by R2, so will be 10 times as high as that through D1. Because of this current ratio, it can be guaranteed that there will be less voltage dropped across D1 than across D2, so the negative input will always fall below the positive input and the oscillator will always reset. It has a low component count. It has very good linearity. For even better linearity, you can replace resistor R6 with a current source.